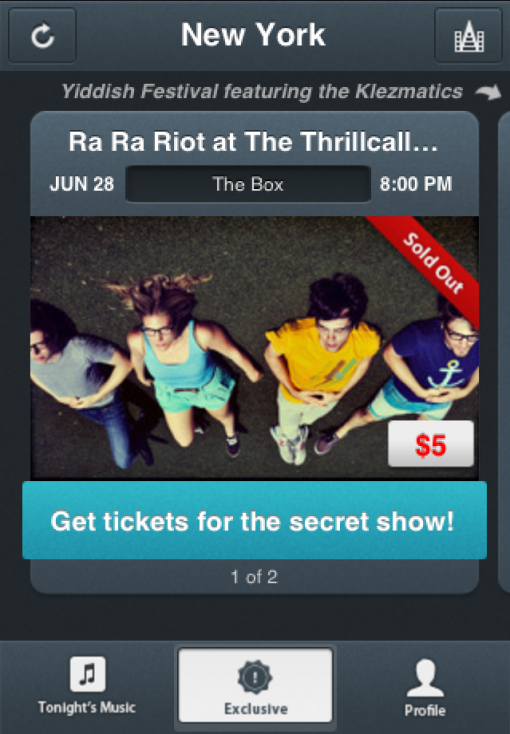 Ra Ra Riot is taking a break from their recording schedule to play a show at The Box on Thursday night (June 28) in NYC. The intimate show is in celebration of the launch of the Thrillcall mobile app in NYC. Like Songkick, Thrillcall will track your music preferences and alert you to gigs by your favorite artists in your area. Unlike Songkick, (but similar to the Live Nation mobile app), Thrillcall also gives you the ability to buy tickets for local shows directly through the app itself. What distinguishes Thrillcall from LiveNation, Songkick, and everyone else in this space I guess, is that Thrillcall has exclusive daily offers for shows*. Read the full Thrillcall press release after the jump. * Goldstar and ScoreBig immediately come to mind when I think of exclusive daily offers for tickets. ScoreBig has a iPhone app which looks like it is more geared towards sports, but it doesn’t look like Goldstar has a mobile app yet. Thrillcall, a live event discovery service with exclusive daily offers, is excited to announce its official New York City (NYC) launch party taking place this Thursday, June 28 at Lower East Side venue, The Box (189 Chrystie Street). By downloading Thrillcall’s free mobile app, users will receive insider’s access to incredible shows every night. This includes the chance to see acclaimed artists Ra Ra Riot and Lissy Trullie in an intimate 300 capacity venue for the Thrillcall launch party. This exciting event celebrates the availability of Thrillcall’s mobile app in NYC and is the first ever concert sold and ticketed exclusively through a mobile app. Tickets will be available via the Thrillcall app, starting Tuesday June 26 at 10:00 a.m. (EST). To download the free app, go to http://getapp.thrillcall.com/. Tickets will cost $5 and all proceeds will go to Oxfam International, an organization working to build a future free from the injustice of poverty. As part of their launch in NYC, Thrillcall has also partnered with the Big Apple’s renowned festival SummerStage presented by AT&T, and the CBGB Festival to offer music fans VIP access and tickets to this summer’s eclectic lineup. Upcoming Thrillcall offers include Childish Gambino at SummerStage, and a number of exclusive offers for the CBGB Festival.